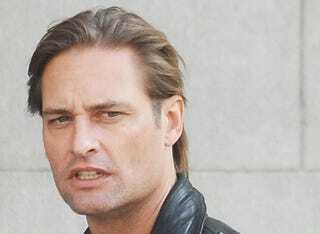 Sawyer himself, Josh Holloway, pauses in the middle of saying something snarky, while filming a scene from Mission Impossible 4. With Brad Bird directing and Holloway co-starring along with Simon Pegg, could this film exceed all our expectations? Also pictured on set with Holloway: Lea Saydoux, who's also listed on IMDB as "rumored" to be in the movie (as is Holloway.) Guess the rumors are true. Now let's hope that this is more of an "ensemble cast" deal, and less of a "supporting cast" thing with Cruise carrying the film. Photos by WENN.com.